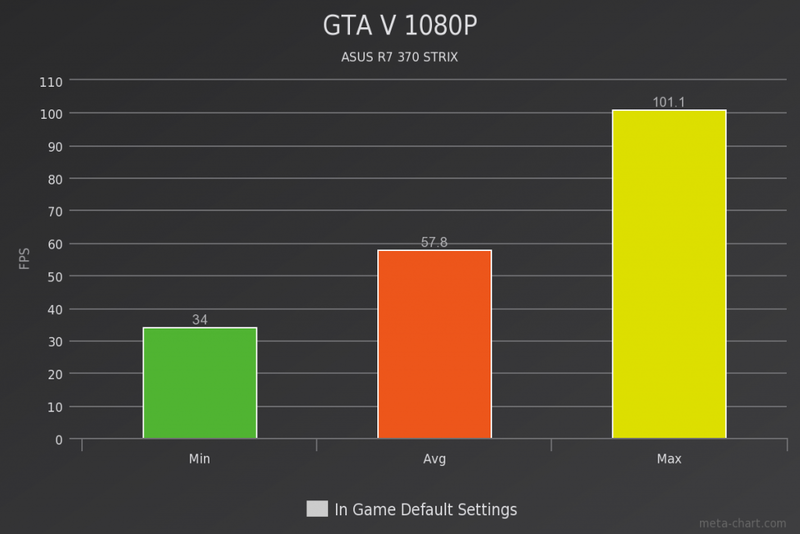 Asus is an extremely well-known company in the PC world having been around since 1989 and in that time have produced some of the most outstanding enthusiast grade products ranging from keyboards to motherboards to monitors. 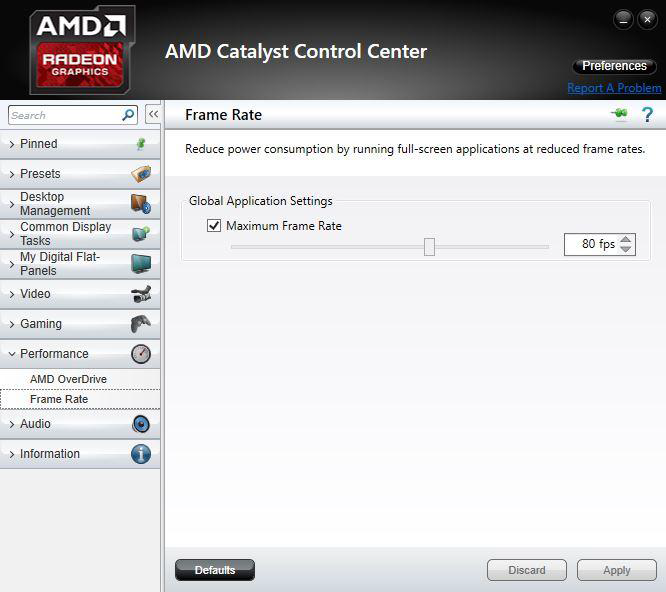 Frame rate targeting control (FRTC) which gives users the ability to set a maximum frame rate (between 55-95fps) in full screen applications which in turn can reduce heat, power consumption and also fan noise but not introduce the traditional stuttering associated with Vsync, This is also helpful when using AMD Freesync monitors seeing as most of them have a set range for Freesync to work (35-95hz for example). 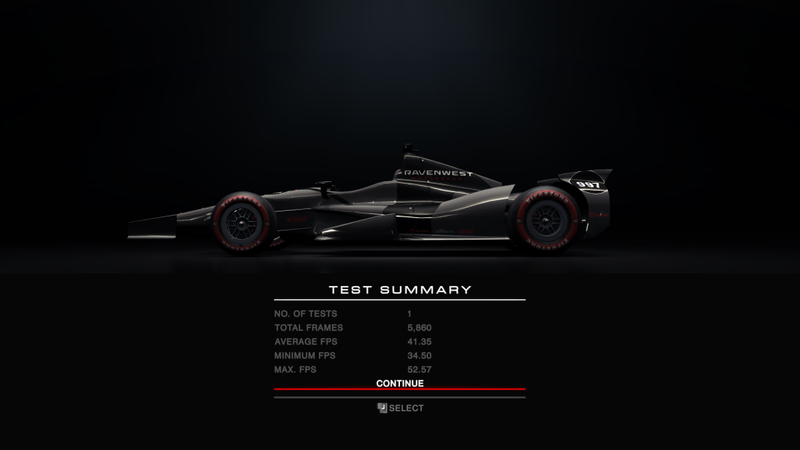 Virtual super resolution (VSR) which allows you to game at higher resolutions than your monitor supports, one of the great things about VSR is its relative performance to the resolution in question that being there is virtually no difference meaning that it’s a great tool for testing out your own GPU performance at a higher resolution, another upside to VSR opposed to things such as SSAA (Super sampling anti-aliasing) is that it works on all games and all engines so you can relive those old classics with great graphical fidelity than before. DirectX 12 (DX12) is the newest graphics API from Microsoft which all Radeon 300 series GPUs support fully. The direct control enables developers to better use your hardware (both CPU and GPU) to deliver an overall better gaming experience thanks to the much smarter and in-depth API. 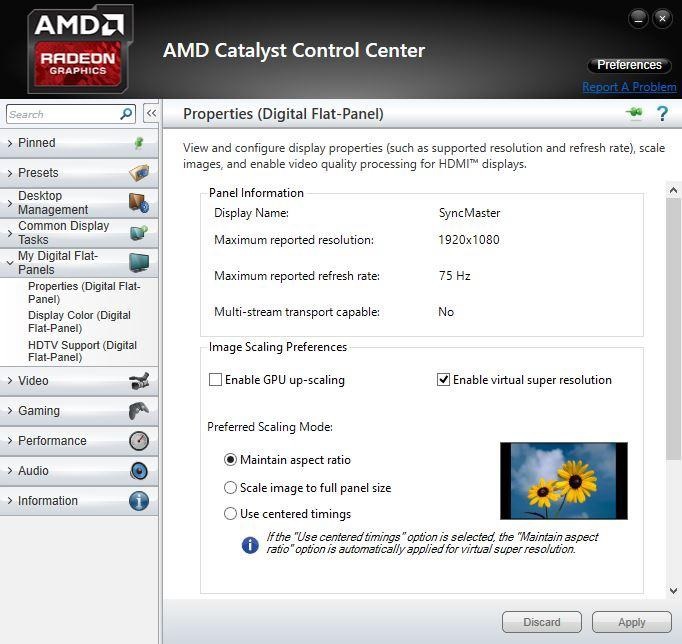 One of the new features that Radeon GPUs will utilize with DX12 is ASYNC (Asynchronous) Shaders which will allow complex graphics task to use all available Radeon graphics resources at the same time meaning it can break down bigger tasks into smaller ones allowing the work to be done more quickly giving you better performance over DX11. As you can see the overall time taken to process the frame is greatly reduced due to the way ASYNC works. 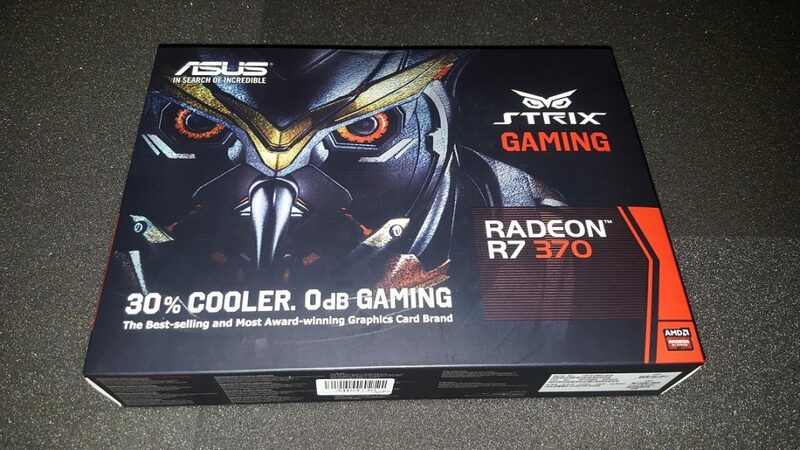 The boxes outward appearance features a mechanical owl with the words ‘30% cooler, 0dB Gaming” in front of it describing that the Strix features 0dB fan technology which means that the fans do not turn on until the GPU hits a certain temperature (in this case it’s 62c) and that it runs 30% cooler in comparison to AMD’s R7 370 reference model. 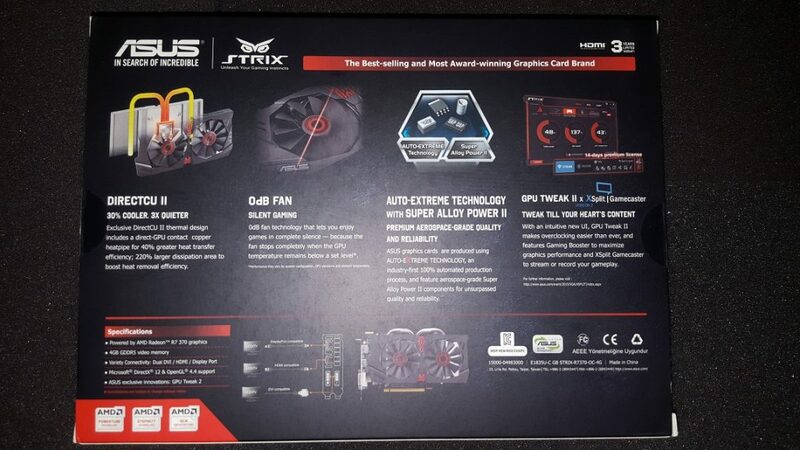 Over on the back side are all the major features about this card which include the DirectCUII fan technology which is based around heatpipes having direct contact with the GPU core, The 0dB fan technology which as i stated before leaves the fans off until a temperature threshold has been passed. 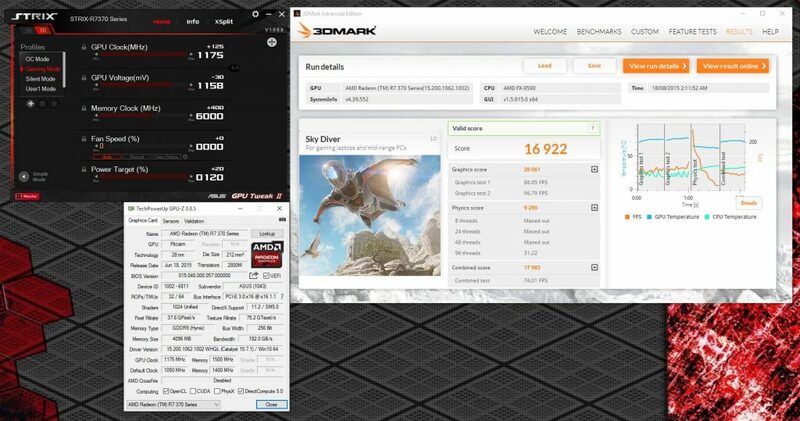 This is one of the newest cards to be built-in Asus’ 100% automated production facility which hopefully means great quality control as it takes human error out of the equation, This card also comes with Asus’ GPU Tweak II overclocking and monitoring tool as well as a copy of XSplit Gamecaster if you like to stream or just record your gameplay. 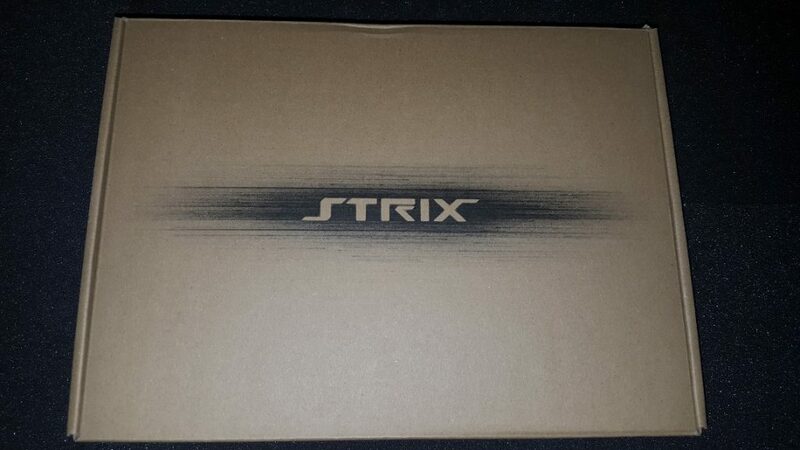 The inside box is very plain and just features the Strix logo printed on. 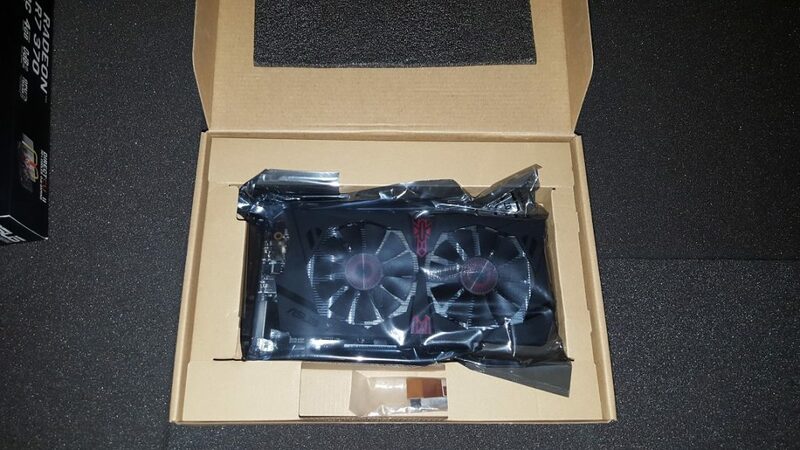 Opening it up we find the 370 in a good-sized anti-static bag inside a nice, snug cardboard shroud with a piece of foam over the top to protect it during shipping. 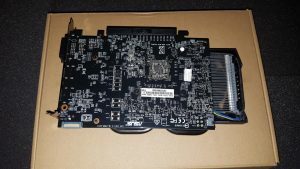 Taking the GPU out of it’s bag we find it to be quite tiny with the PCB only just being longer than the PCIe slot it fits into it, the card dimensions are: 214mm long by 125mm wide and 42mm high. 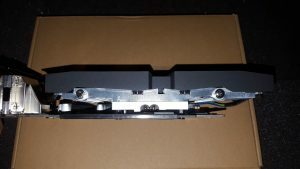 The cooler is Asus’ own design and features two 8mm heatpipes soldered to a decent sized heatsink so this should keep the temps down nicely. 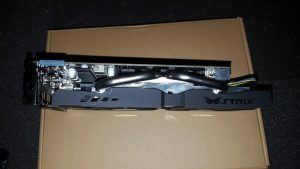 The R7 370 Strix has a TDP of 110w and takes a single 6pin power connector, Asus quote power consumption of up to 150w for this card, it has a 4+1 power phase with 4 being for the core and 1 for the memory so there is a bit of overclocking potential in it. 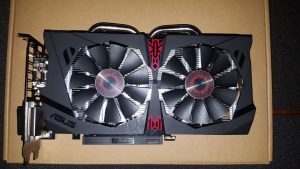 The shroud is made from a durable plastic but doesn’t manage to feel “cheap” and the overall look of the card is quite nice, it’s a little flashy but nothing over the top and the stickers add a bit of colour to the card, there is no back plate but on a card such as this i wouldn’t expect one. 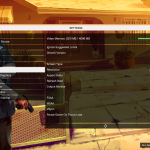 It has a single CrossfireX finger so you can use another R7 370 in a Crossfire setup if you choose. 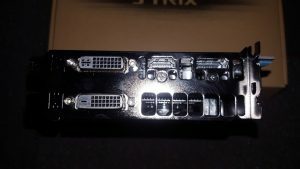 We have a good range of display connectors on this card: a DVI-D, DVI-I, HDMI and DP ports so you are pretty much covered no matter your choice in display. 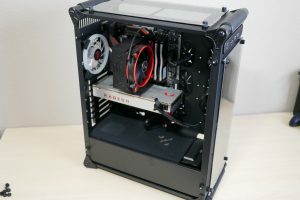 What’s left in the box is a Crossfire bridge, a optical disc with the 15.2 driver for Windows 7 and Windows 8.1, the Asus VGA manual, Asus GPU Tweak for your overclocking fun and the XSpilt Gamecaster program among others. 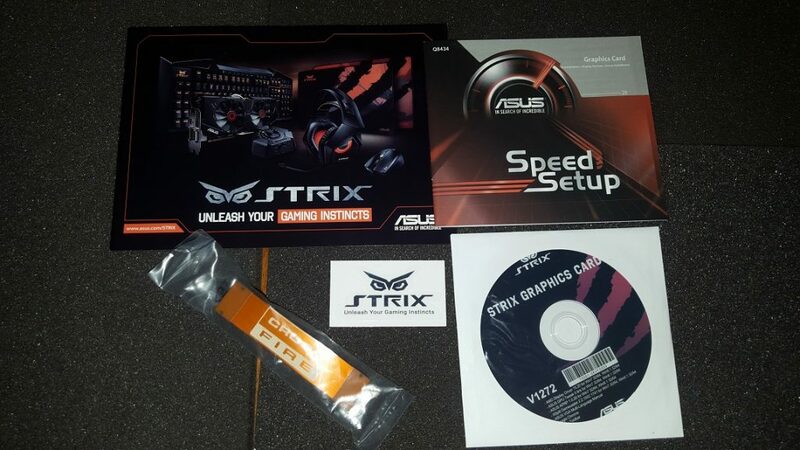 We also have a quick install guide booklet, an Asus Strix pamphlet showcasing some of Asus’ other Strix branded products and a nice little Strix sticker for you to use wherever you please. 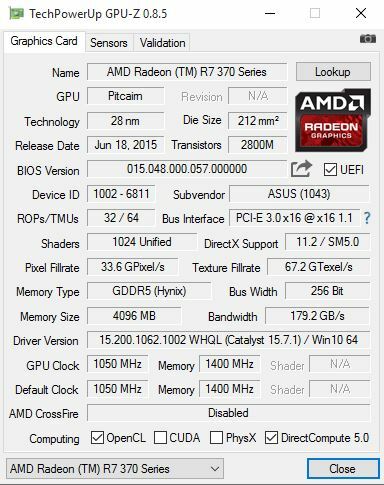 This particular R7 370 has a core clock speed of 1050Mhz in gaming mode and 1070Mhz in OC mode, a memory speed of 1400Mhz (5600Mhz efffective) on a 256-bit bus. 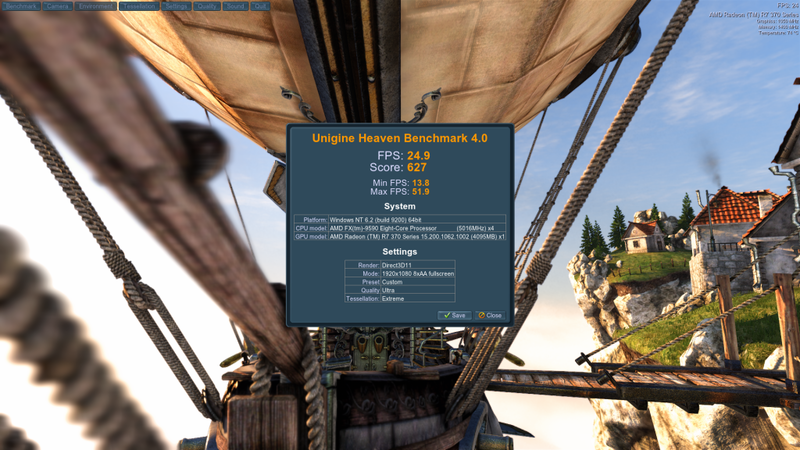 Essentially this card uses the same architecture (Pitcairn) as the older R9 270 and before that the HD 7850, but does that mean this card isn’t up to 1080p gaming? 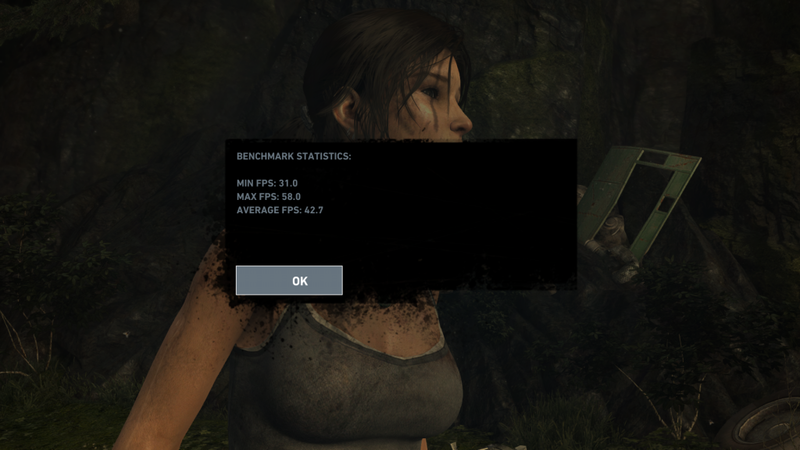 At 1080p we are getting playable frame rate with Tomb Raider but at 1440p it’s just not fast enough to cope with the more demanding resolution. 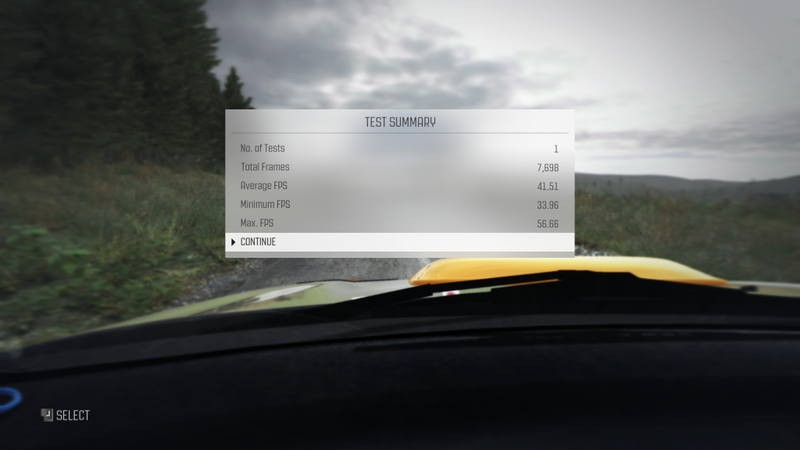 We get a very nice 60fps (well 59.98 to be accurate) at 1080p with this card and a still quite playable 41.51fps at 1440p, not a bad performance. 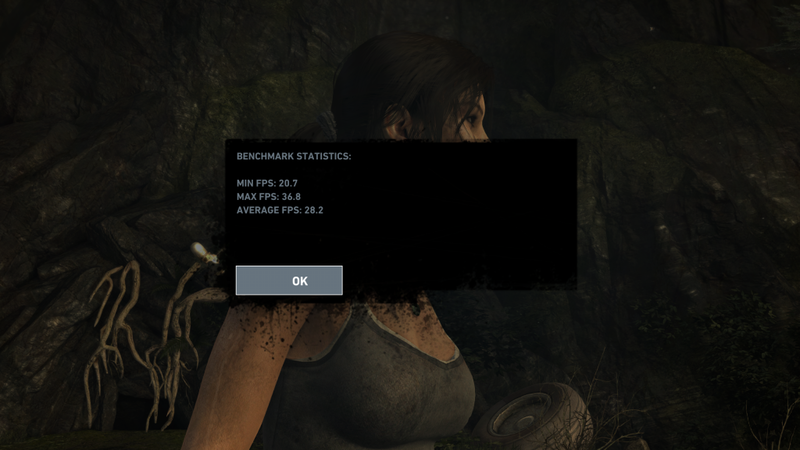 1080p is looking good with a nice 57.8fps avg but again 1440p is proving to be a bit much for it. 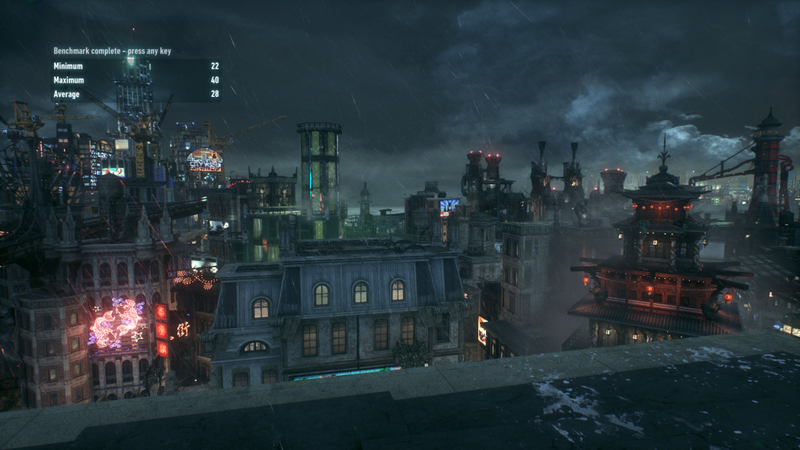 Again we get nice frame rates at 1080p and playable but not brilliant fps at 1440p. 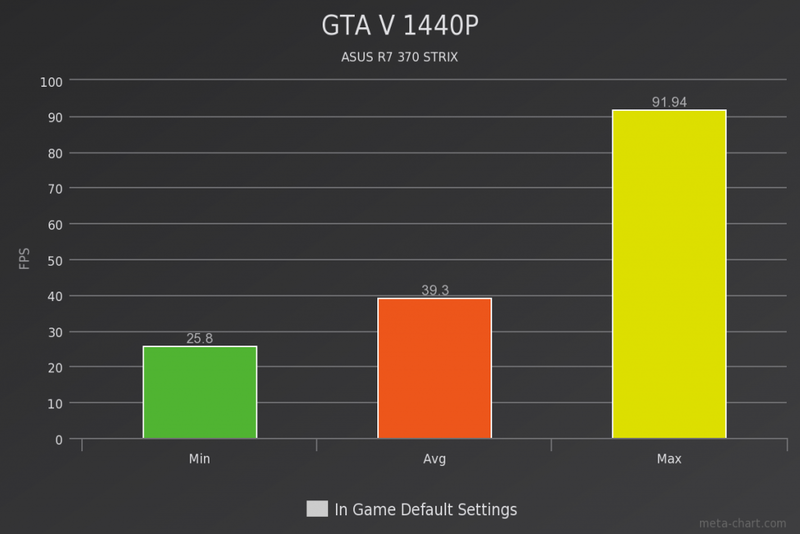 This card at 1080p manages 47.3 avg fps which is quite playable and at 1440p manages to squeeze out 32.5 fps avg. Sniper Elite 3 is a tactical shooter developed by Rebellion and set in North Africa during WWII, You play as OSS Sniper Karl Fairburne and make your way through multiple countries carrying out you varied missons. 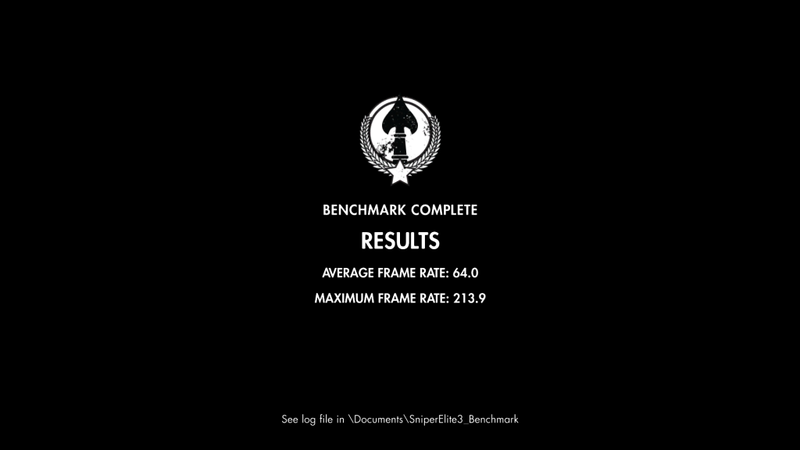 For 1080p the 370 managed a very nice 64fps avg and at 1440p still got 44.4fps avg, pretty good. 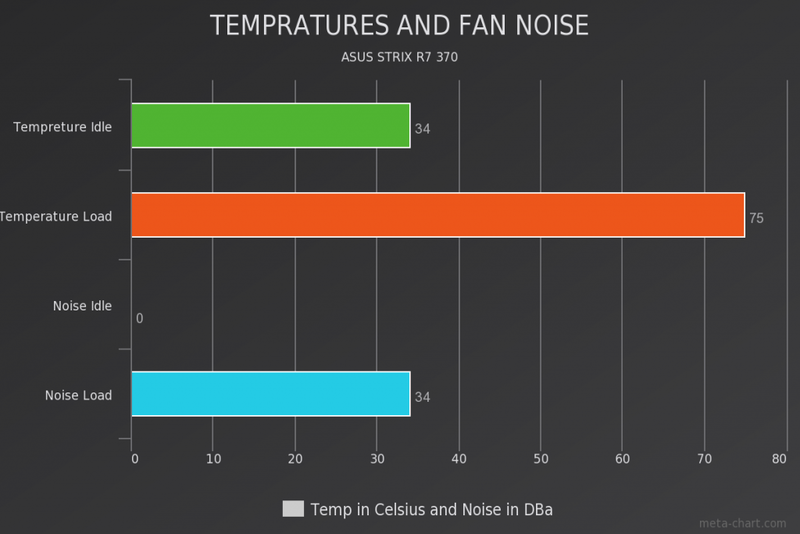 Thanks to the 0 dB fan technology on the Strix this card was completely silent at desktop and low stress usage and only got up to 34 dBa during all of my stress testing and benchmarks. 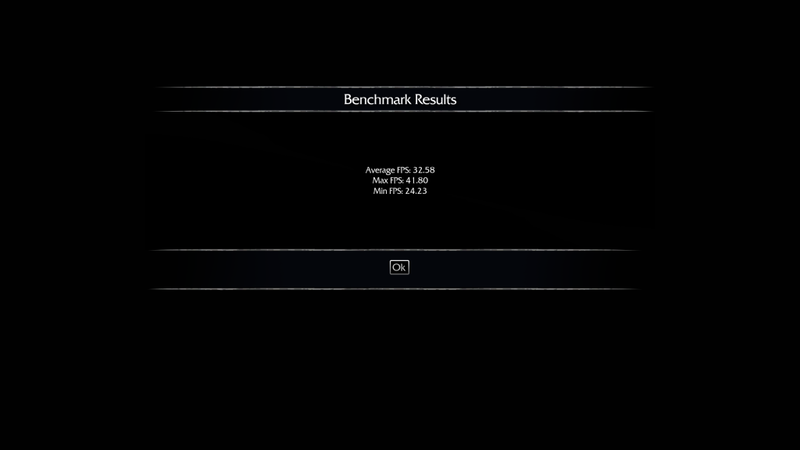 The temperatures were perfectly acceptable and only reached a top of 75c with all the stock settings. 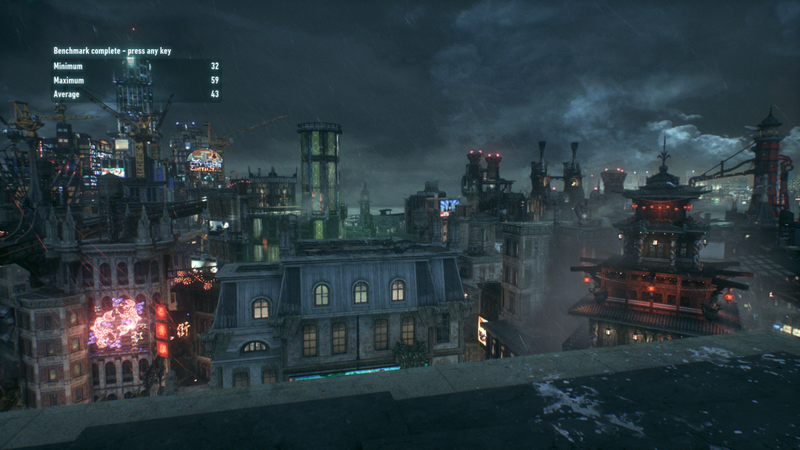 Well then, This architecture has gone through quite the round of cosmetic surgery and facelifts in the past few generations but it’s still performing decently well in alot of games averaging around the 40-50fps mark for the most part which would make it a good GPU to pair with a Freesync monitor, the issue there is that the 370 doesn’t support Freesync with it having the older architecture, I feel as though that is a missed target for AMD. 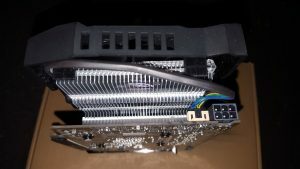 The cooler on this card was fantastic at idle being completely silent and at load it wasn’t really audible so i have to give Asus credit for that one, the single 6-pin power connector means it doesn’t use much power making it a good choice for those with smaller wattage PSU’s ,the factory overclock from Asus is among the fastest out there in the R7 370 lineup and the 4GB of memory is a nice addition as well especially if you are considering crossfire. Freesync compatibility aside this card does well for 1080p gaming, it looks good, is inaudible at idle and not loud at all under full gaming load, has a nice factory OC and a good amount of memory so yes i could recommend this if you are after an AMD card for 1080p gaming and this falls into your price range. 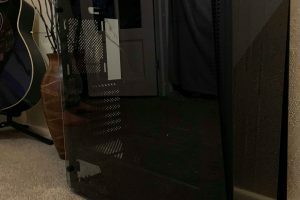 Great review as always Bilko. 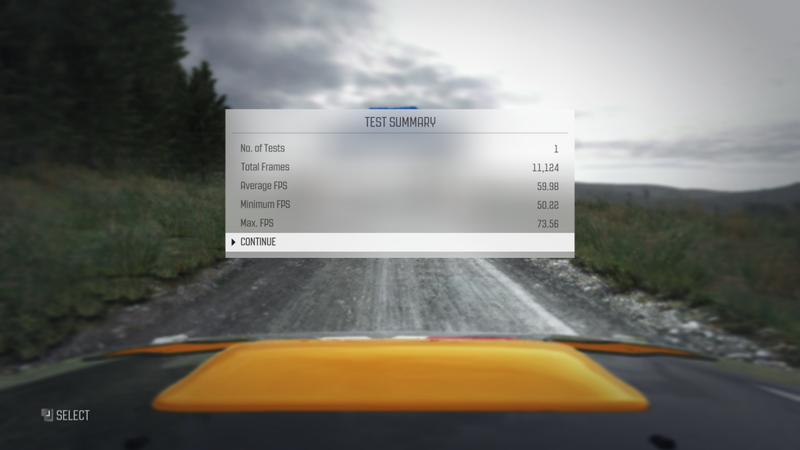 I like the scoring system layout as well.